NEW YORK—Sections of a Buddhist temple outside the town of Pengzhou in Sichuan province have been converted into a makeshift detention center for brainwashing local residents who practice Falun Gong, according to sources inside China. At least 14 Falun Gong practitioners have been held at the facility since June 2010, with many reporting abuse and torture. News of abuses at Sansheng Temple emerges amidst a three-year, multi-billion dollar campaign to “transform” the vast majority of Falun Gong practitioners in China, primarily through the use of brainwashing centers (news). 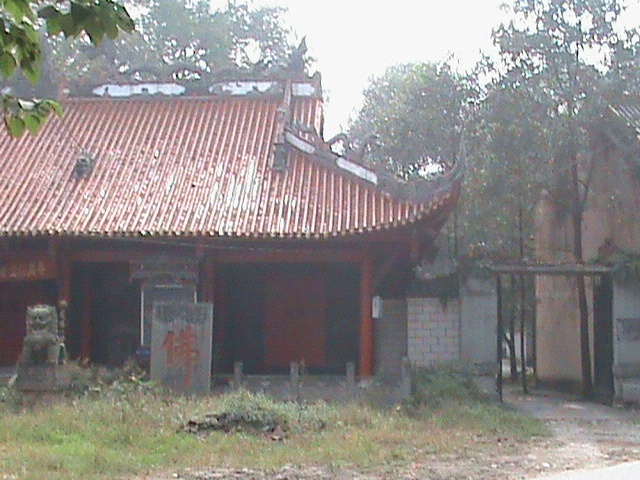 Sansheng Temple (???) dates back to the period of the Three Kingdoms (220-280 AD) and is registered under the Sichuan provincial government’s Religious Affairs Bureau (link / screenshot). It is located about 30 miles from the provincial capital Chengdu in a remote area of Fenglechang in Guihua Town, under the jurisdiction of Pengzhou city. Photos sent from China show the site having a small pagoda, while online descriptions on official websites flaunt scenic surroundings (link / screenshot). Since mid-2010, the 610 Office, an extralegal Communist Party-based security force created to persecute Falun Gong, has taken advantage of the temple’s relative geographic isolation to convert it into a brainwashing center for Falun Gong. Practitioners detained at the center are forced to watch videos slandering Falun Gong and its founder, and are physically and mentally tortured. Posters denouncing Falun Gong were hung up all over the facility, including in the restrooms. To avoid having passersby see or hear the beatings, all of the windows, doors, and curtains are closed, and the volume of the TV is turned up to its maximum capacity. Those employed to persecute practitioners at the facility are enticed with a variety of financial incentives. One detailed case reported to the Falun Dafa Information Center relays the ordeal of a 48-year-old farmer, Ms. Qing Guangrong, who was abducted from her home by local party officials and 610 Office agents on March 29, 2011. She was taken to the temple, where she was held in isolation and suffered multiple rounds of beatings. She was only released nearly four months later on July 23, 2011 (see here for more details). As of mid-September, at least six other Falun Gong practitioners were known to still be held at the brainwashing center: Li Yongxian, Tan Shunmin, Zhang Youyi, Zheng Weigang, Zhang Guofang and Zhang Yixiang. Those detained at the temple are among over 400 Falun Gong practitioners in Sichuan province known to have been taken for brainwashing since July 2011, according to records collected by the Chinese-language Falun Gong website Minghui.org from its network of contacts inside China. The CCP has used brainwashing centers to detain Falun Gong practitioners since 1999. Similar to “black jails” used to house petitioners, such centers are makeshift jails, existing outside of the legal system, where practitioners are held for indefinite periods of time and subjected to a range of abuses with the aim of forcing them to renounce their faith and pledge allegiance to the CCP. While some are located in government-owned buildings, many are held in schools, hotels, and now, Buddhist temples. Over the past two years, as part of a reinvigorated campaign to forcibly convert Falun Gong practitioners, the use of brainwashing centers has intensified across China.